The present study examined the relative effects of mindful acceptance and reappraisal on metacognitive attitudes and beliefs in relation to rumination and negative experiences. A small but growing literature has compared the effects of these strategies on immediate emotional experience, but little work has examined the broader, metacognitive impact of these strategies, such as maladaptive beliefs about rumination. One hundred and twenty-nine participants who reported elevated symptoms of depression were randomly assigned to receive brief training in mindful acceptance, reappraisal, or no training prior to undergoing an autobiographical sad mood induction. Participants rated their beliefs in relation to rumination and negative experiences before and after instructions to engage in mood regulation. Results showed that relative to reappraisal or no training, training in mindful acceptance resulted in greater decreases in maladaptive beliefs about rumination. 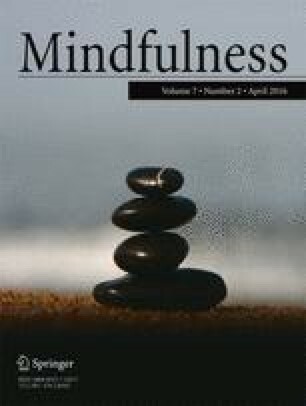 The study suggests that training in mindful acceptance promotes beneficial changes in metacognitive attitudes and beliefs relevant to depression, and contributes to a greater understanding of the mechanisms through which mindfulness-based interventions lead to positive outcomes. The online version of this article (doi: 10.1007/s12671-015-0480-x) contains supplementary material, which is available to authorized users. What this technique involves is to simply be aware of your thoughts, emotions, and experiences in a non-judgmental manner, to accept them to be as they are in the present moment, without engaging in thinking about them or pushing them away. Typically, our natural tendency when experiencing difficult thoughts and emotions is that we tend to think about them over and over again, judge them as good or bad, or try to push them away and not want to deal with them. The technique of mindfulness is to avoid these two opposites; so instead of engaging with our thoughts and emotions or pushing them away, we practice accepting and being aware of them as simply thoughts and emotions and watching them come and go, as if they are waves in the ocean (or clouds against the sky). One good way of understanding what mindfulness is is via doing an experiential exercise. Now, close your eyes, if that feels comfortable for you, and allow the body to relax… (PAUSE)… the first step is being aware, really aware, of what is going on with you right now. (PAUSE)…. Notice if there are any physical sensations in the body… tightness… or tension in any part of the body… (PAUSE)… any thoughts you are having… (PAUSE)… any emotions you are feeling… (PAUSE)… When you are ready, I would like you to tell me what are you noticing now about your present experience…… (PAUSE)…….. What physical sensations are you feeling? (PAUSE)……….What emotions are you feeling? (PAUSE)…….. What thoughts are running through your mind (PAUSE) ………. If you like, you can think of thoughts as if they were projected on the screen at the cinema. You sit, watching the screen, waiting for the thoughts or images to arise. When they do, you pay attention to them so long as they are there “on the screen” and then let them go as they pass away. To summarize, the purpose of this technique is to bring your attention back to your direct, present experience, rather than engaging in thinking about them (or what they might mean) or turning your attention away from them. The idea is to notice and allow your present experience, including your thoughts and emotions, in a non-judgmental manner. What this technique involves is to change our thoughts or interpretations about events that upset us—meaning—to change the way we think about the event. Typically, the reason we experience difficult thoughts and emotions is that we tend to have very negative interpretations about the event that triggers them. The technique of reappraisal is to change the way we interpret the event, so that we feel less negatively about it. It is the attempt to develop a more positive interpretation about a situation that at first glance may appear very negative to us. There are many ways one can change one’s interpretations about a situation. One can start, for example, by asking “Is this the only way I can think about the event or the situation?” “Is there a more positive way of construing the event so that I feel less negatively about it?” “What could be another way to look at what happened?” If you like, you can also challenge your negative thoughts or interpretations of an event, disprove them by reasoning or by drawing from your other experiences, and replace them with more positive interpretations. Let us do a practice exercise to demonstrate how this technique works. Let us say you have a colleague, with whom you have a fairly good relationship, who would always smile at, or say hi to, you each time you run into her. However, there is this one time when you ran into her and she was not smiling at you. What might be some thoughts that you have about that in that moment? Also, one can try to think of some positive aspects of the event, such as lessons that you have learned and ways you can improve in the future if the same event or situation was to occur again. Think of whether there is any positive meaning that you can derive from the incident. To summarize, the purpose of this technique is to think about the situation that upsets us in a different way, or cast it in more positive light, so that we are less emotionally impacted by it.